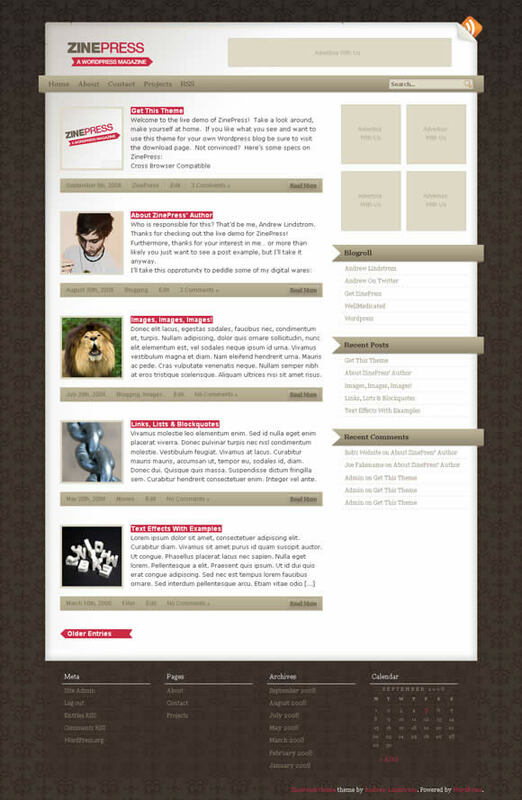 ZinePress free WordPress magazine style theme shines! The new free WordPress magazine style theme, by designer Andrew Lindstrom of the blog Wellmedicated.com is a sharp looking theme. The theme, just released, is cross browser compatable, widget ready in the sidebar and footer, ad ready and validates in XHTML and CSS. And did I say it was free. Great work Andrew. This is the 2nd free theme of Andrew’s that I have downloaded. The other one was his great theme Grass Roots, which I have already reviewed previously. I wish I had the time to create some of these free themes. It does look like a lot of fun coming up with these ideas. I might just have to take a crack at making one too. Should a designer tell his medical clients to jump into social media? Why is it that the automatic WordPress upgrade fails? WordPress Automatic Upgrade plugin rocks!